The problem was the cheese. 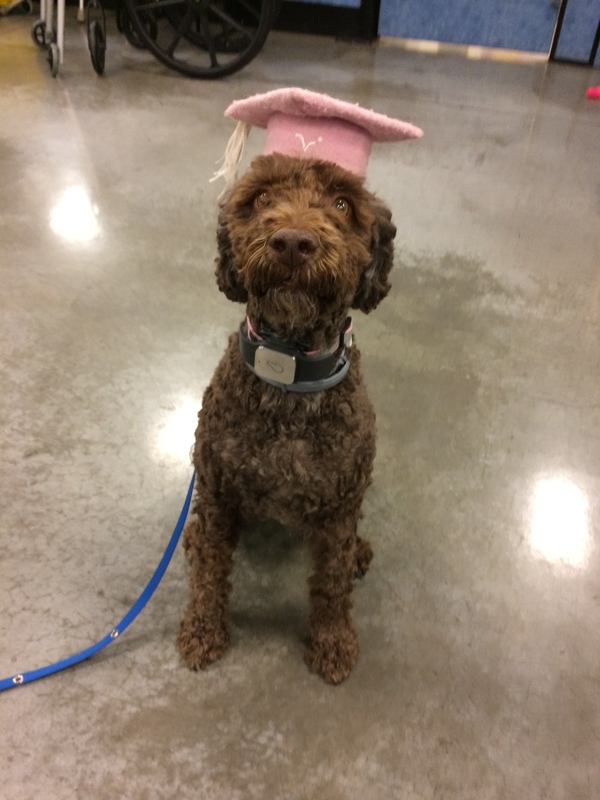 Recently, I enrolled in an advanced therapy dog class with my little brown dog, Kibbi. The class goes beyond just the typical obedience commands — sit, stay, come. It prepares dogs and their dog handlers to go into public and community facilities — schools, nursing homes, hospitals — and to be calm and helpful to people they encounter. This isn’t Kibbi’s first rodeo in the therapy dog world. She is 7 years old, and my husband, Preston, went through therapy dog class with her and passed the certification test when she was about a year old. But it is my first rodeo. Even though Kibbi is already certified, every handler has to become certified, but lucky for me, she has been serving as a therapy dog (with Preston) working with youth at a local medical facility for years, and she is the official therapy dog of our funeral home, Morris-Baker. So how hard could this be for me? But now the dog also has to be able to go up to a person sitting in a chair who holds out his/her hand offering food to the dog, and the handler is supposed be able to command the dog not to eat it. What? The other night in class, Kibbi and I attempted this exercise, with the trainer sitting in the chair. She did not offer a dog treat — that would have been difficult enough — but instead she offered something Kibbi is never offered: a piece of cheese. Smelly, yummy, mysterious and rare. To Kibbi’s credit, she did so-so with this temptation. I had to restrain her a little the first few times to keep her from eating the cheese, but she got the hang of it by the third or fourth time, and by the fifth, she wasn’t tugging on the leash at all. Victory! I was feeling proud of her, and proud of myself, as we continued on to the next exercise, the one where she has to walk over a piece of food on the ground and not eat it. This is the one she has done dozens of times over the years, the easy-breezy one. And on that night, it was. Kibbi passed the cheese successfully once, and I praised her and gave her a treat. Good girl, good girl! She passed it a second time. Such a smart girl! Then she passed it a third time, and I proudly praised her and gave her a treat. Wonderful! Then she turned right around and snatched up the piece of cheese before I could stop her. I could have been upset with her, but I thought it was funny. And I understood it — she just wanted her piece of cheese. Don’t we all sometimes, especially after someone keeps telling us over and over that we cannot have it? I’m not sure if we will pass the eventual test together, but we’re going to try. Preston has told me countless stories of people Kibbi has encountered and helped calm and comfort, shift their mood and lift their spirits. The truth is Preston is great with her. His positive attitude and relaxed demeanor bring out the best in Kibbi. Last year, I got to witness them together during Camp Courage, a one-day camp for children who have recently experienced a loss. I stood on the sidelines and observed as Preston and Kibbi spent the day with the children. Afterward, a facilitator talked about the wonderful effect Kibbi had on the children as they sorted through their feelings of grief and learned coping skills to help them heal. Kibbi will be at Camp Courage again this year with Preston. Perhaps I won’t be just an observer this time. Kibbi and I are working daily on our commands, and I am beginning to realize that the practice isn’t for her — it’s for me. And that maybe the problem wasn’t really the cheese. Editor’s note: Camp Courage will be held June 27 and is open to children from kindergarten through eighth grade who are grieving the death of a family or friend. Applications are due June 2. Camp Courage is operated by Mountain States Health Alliance Hospice in partnership with Morris-Baker Funeral Home and Cremation Services. For more information, please call Anna Butler, Mountain States Hospice chaplain, at 431-7663. Note to the reader: As you can probably guess from the graduation photo of Kibbi, the duo did indeed pass the test. To learn more about how Kibbi can help your family, please click here.